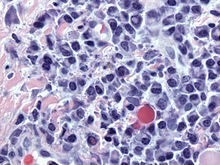 Malignant plasma cells (plasmacytoma), many displaying characteristic "clockface nuclei", also seen in normal plasma cells. H&E stain. Plasma cell with distinct clear perinuclear region of the cytoplasm containing a large number of Golgi bodies. Plasma cells, also called plasma B cells, plasmocytes, plasmacytes, or effector B cells, are white blood cells that secrete large volumes of antibodies. They are transported by the blood plasma and the lymphatic system. Plasma cells originate in the bone marrow; B cells differentiate into plasma cells that produce antibody molecules closely modelled after the receptors of the precursor B cell. Once released into the blood and lymph, these antibody molecules bind to the target antigen (foreign substance) and initiate its neutralization or destruction. 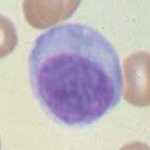 Plasma cells are large lymphocytes with a considerable nucleus-to-cytoplasm ratio and a characteristic appearance on light microscopy. They have amphophilic cytoplasm and an eccentric nucleus with heterochromatin in a characteristic cartwheel or clock face arrangement. 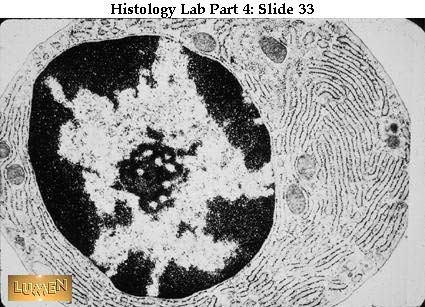 Their cytoplasm also contains a pale zone that on electron microscopy contains an extensive Golgi apparatus and centrioles (EM picture). Abundant rough endoplasmic reticulum combined with a well-developed Golgi apparatus makes plasma cells well-suited for secreting immunoglobulins. Other organelles in a plasma cell include ribosomes, lysosomes, mitochondria, and the plasma membrane. Terminally differentiated plasma cells express relatively few surface antigens, and do not express common pan-B cell markers, such as CD19 and CD20. Instead, plasma cells are identified through flow cytometry by their additional expression of CD138, CD78, and the Interleukin-6 receptor. In humans, CD27 is a good marker for plasma cells, naive B cells are CD27-, memory B-cells are CD27+ and plasma cells are CD27++. The surface antigen CD138 (syndecan-1) is expressed at high levels. Another important surface antigen is CD319 (SLAMF7). This antigen is expressed at high levels on normal human plasma cells. It is also expressed on malignant plasma cells in multiple myeloma. Compared with CD138, which disappears rapidly ex vivo, the expression of CD319 is considerably more stable. After leaving the bone marrow, the B cell acts as an antigen presenting cell (APC) and internalizes offending antigens, which are taken up by the B cell through receptor-mediated endocytosis and processed. Pieces of the antigen (which are now known as antigenic peptides) are loaded onto MHC II molecules, and presented on its extracellular surface to CD4+ T cells (sometimes called T helper cells). These T cells bind to the MHC II-antigen molecule and cause activation of the B cell. This is a type of safeguard to the system, almost like a two-factor authentication method. First, the B cells have to encounter a foreign antigen, and are then required to be activated by T helper cells before they differentiate to specific cells. Upon stimulation by a T cell, which usually occurs in germinal centers of secondary lymphoid organs like the spleen and lymph nodes, the activated B cell begins to differentiate into more specialized cells. Germinal center B cells may differentiate into memory B cells or plasma cells. Most of these B cells will become plasmablasts (or "immature plasma cells"), and eventually plasma cells, and begin producing large volumes of antibodies. Some B cells will undergo a process known as affinity maturation. This process favors, by selection for the ability to bind antigen with higher affinity, the activation and growth of B cell clones able to secrete antibodies of higher affinity for the antigen. The most immature blood cell that is considered of plasma cell lineage is the plasmablast. Plasmablasts secrete more antibodies than B cells, but less than plasma cells. They divide rapidly and are still capable of internalizing antigens and presenting them to T cells. A cell may stay in this state for several days, and then either die or irrevocably differentiate into a mature, fully differentiated plasma cell. Differentiation of mature B cells into plasma cells is dependent upon the transcription factors Blimp-1/PRDM1 and IRF4. After the process of affinity maturation in germinal centers, plasma cells have an indeterminate lifespan, ranging from days to months. Recently they have been shown to reside for much longer periods in the bone marrow as long-lived plasma cells (LLPC). They secrete high levels of antibodies, ranging from hundreds to thousands of antibodies per second per cell. Unlike their precursors, they cannot switch antibody classes, cannot act as antigen-presenting cells because they no longer display MHC-II, and do not take up antigen because they no longer display significant quantities of immunoglobulin on the cell surface. However, continued exposure to antigen through those low levels of immunoglobulin is important, as it partly determines the cell's lifespan. The lifespan, class of antibodies produced, and the location that the plasma cell moves to also depends on signals, such as cytokines, received from the T cell during differentiation. Differentiation through a T cell-independent antigen stimulation (stimulation of a B cell that does not require the involvement of a T cell) can happen anywhere in the body and results in short-lived cells that secrete IgM antibodies. The T cell-dependent processes are subdivided into primary and secondary responses: a primary response (meaning that the T cell is present at the time of initial contact by the B cell with the antigen) produces short-lived cells that remain in the extramedullary regions of lymph nodes; a secondary response produces longer-lived cells that produce IgG and IgA, and frequently travel to the bone marrow. For example, plasma cells will likely secrete IgG3 antibodies if they matured in the presence of the cytokine interferon-gamma. Since B cell maturation also involves somatic hypermutation (a process completed before differentiation into a plasma cell), these antibodies frequently have a very high affinity for their antigen. Plasma cells can only produce a single kind of antibody in a single class of immunoglobulin. In other words, every B cell is specific to a single antigen, but each cell can produce several thousand matching antibodies per second. This prolific production of antibodies is an integral part of the humoral immune response. 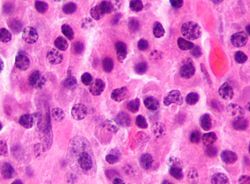 Plasmacytoma, multiple myeloma, Waldenström macroglobulinemia and plasma cell leukemia are malignant neoplasms ("cancer") of the plasma cells. Multiple myeloma is frequently identified because malignant plasma cells continue producing an antibody, which can be detected as a paraprotein. Common variable immunodeficiency is thought to be due to a problem in the differentiation from lymphocytes to plasma cells. The result is a low serum antibody level and risk of infections. Primary amyloidosis (AL) is caused by the deposition of excess immunoglobulin light chains which are secreted from plasma cells. ^ "Plasma cell - biology". britannica.com. ^ "Plasma Cell - LabCE.com, Laboratory Continuing Education". www.labce.com. Retrieved 2 June 2018. ^ Bona, Constantin; Francisco A. Bonilla (1996). "5". Textbook of Immunology. Martin Soohoo (2 ed.). CRC Press. p. 102. ISBN 978-3-7186-0596-5. ^ Rawstron AC (May 2006). "Immunophenotyping of plasma cells". Curr Protoc Cytom. Chapter. 6: Unit6.23. doi:10.1002/0471142956.cy0623s36. ISBN 0-471-14295-6. PMID 18770841. ^ Frigyesi I (Jan 2014). "Robust isolation of malignant plasma cells in multiple myeloma". Blood. 123 (9): 1336–40. doi:10.1182/blood-2013-09-529800. PMID 24385542. ^ a b Neuberger, M. S.; Honjo, T.; Alt, Frederick W. (2004). Molecular biology of B cells. Amsterdam: Elsevier. pp. 189–191. ISBN 0-12-053641-2. ^ Bertil Glader; Greer, John G.; John Foerster; Rodgers, George G.; Paraskevas, Frixos (2008). Wintrobe's Clinical Hematology, 2-Vol. Set. Hagerstwon, MD: Lippincott Williams & Wilkins. p. 347. ISBN 0-7817-6507-2. ^ a b c d e Walport, Mark; Murphy, Kenneth; Janeway, Charles; Travers, Paul J. (2008). Janeway's immunobiology. New York: Garland Science. pp. 387–388. ISBN 0-8153-4123-7. ^ Kuby, Janis; Kindt, Thomas J.; Goldsby, Richard A.; Osborne, Barbara A. (2007). Kuby immunology. San Francisco: W.H. Freeman. p. 13. ISBN 1-4292-0211-4. ^ a b c Federico Caligaris-Cappio; Manlio Ferrarini (1997). Human B Cell Populations (Chemical Immunology) (v. 67). S. Karger AG (Switzerland). pp. 103–104. ISBN 3-8055-6460-0. ^ Kierszenbaum, Abraham L. (2002). Histology and cell biology: an introduction to pathology. St. Louis: Mosby. p. 275. ISBN 0-323-01639-1. This page was last edited on 4 December 2018, at 17:49 (UTC).